I will hold my third retreat in Vermont for this year, from November 8-11, teaching my workshop “Designing Ganseys”. This was such a fun and successful retreat last year that it is being offered again this year in conjunction with the release of my new book! You can go to this page to get the low-down on the details (how to get here, where to stay, the schedule, and more)! Students will learn how to construct a Gansey, a sweater form prevalent in the 19th century and early part of the 20th century among the fishermen of the British Isles. On the first class day, a small scale sweater will be knitted using traditional construction techniques including the classic Channel Island Cast-on, split welts, seam stitches, traditional knit/purl patterns, the underarm gusset, the perpendicular shoulder join, picked-up sleeves, and three choices for the collar. Alternative methods to these techniques will also be explored. 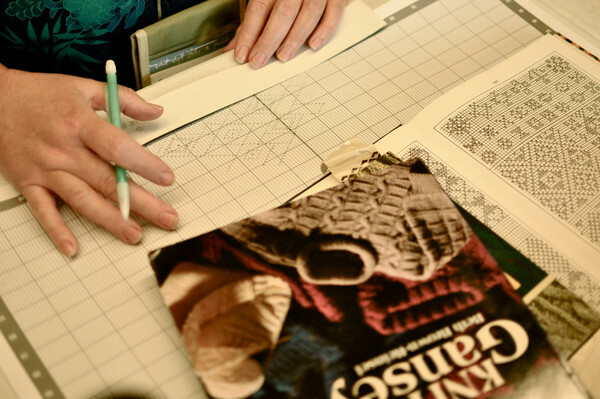 The Design Class continues over the next two days from the 1-day Gansey sampler class, and explores the design process: Design details (sweater attributes), the Silhouette (sweater size), and the Surface Design (sweater patterning). Each phase will be explained and students will be able to begin planning a full-sized garment. Books with charts and large format graph paper will be provided. Level: Intermediate- student should have previous experience knitting a sweater and must be proficient with double-pointed needles, Magic Loop, or working with two circulars for little sampler. To get more information or to register, email Marilyn King who handles registrations.